This is a post in which I try to raise awareness of and get passionate about something that myself, and too few people in the world, don’t know enough about. After recently listening to the Dalai Lama speak in Dharamsala, and spending time with Lobsang, a Tibetan monk, the plight of the Tibetan people has stuck a powerful chord in me. After meeting those guys, I started to do a little research; the statistics I read were horrifying. I’m talking about the inhumane, illegal and brutal Chinese annexation of Tibet. Everybody has heard the slogan and seen the t-shirt. 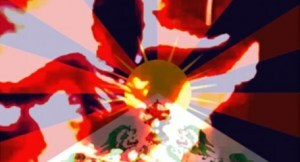 “FREE TIBET.” The brilliant Free Tibet website can argue this terribly important case far more eloquently than me, and so the information that follows is courtesy of them.